Many plants have natural ways of defending themselves against predators, including man. Some plants use obvious defenses, such as stinging nettle-like strategies and burning or blistering latex resins. Other plants use different methods to incapacitate a predator, which include gastrointestinal distress (vomiting or purgation), blindness, neurological disability, or even asphyxia. This clearly illustrates the ingenuity of plant chemistry which, while daunting, has lead to some rather extraordinary discoveries. In Australia, the flora was largely unknown to the early explorers. Much of it was simply unfathomable, which made comparisons with more familiar plants somewhat risky. In the search for food, early inhabitants of Australia utilized poisonous plants that contained fish poisons (piscicides). A need to find staple dietary items - notably root crops with low toxicity, such as starchy yam tubers - was imperative. Under cultivation, certain species gradually survived a selection process that sought less toxic varieties and high-yielding crop candidates. Some plants were found to yield palatable fruits when they ripened, although not all plants, even if they looked the same, lost their toxicity during the process. The poisonous potential of numerous plants coincided with a medicinal effect that could not be ignored. What was the difference between a poisonous, an edible, or a therapeutic effect? These discoveries were not only pivotal for the remedial use of many plants, they were to open up entire new realms of chemical discovery that have had enormous ramifications for the worlds of medicine and the culinary arts. This invaluable book is meticulously researched and is designed to enhance the appreciation of the medicinal history of Australia's flora, as well as its unique contributions to everyday life and its possible future potential. (Series: Medicinal Plants in Australia - Vol. 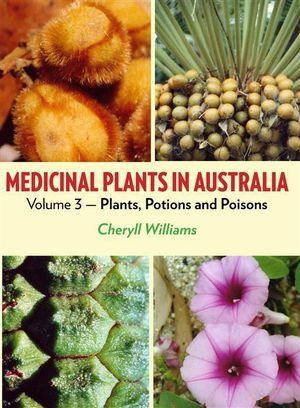 3) *** "Australian author Cheryll Williams is more than familiar with the potential of numerous plants that inhabit this continent. As a qualified acupuncturist and medical herbalist of long experience, she is familar with prehistoric survivors that have long been a source of both sustenance and perilous consequence to humans. The book is heavily illustrated in full color with photographs of poisonous flora and traditional remedies." - Marilyn K. Alaimo, garden writer and volunteer, Chicago Botanic Garden *** "I am impressed by these two volumes [v.3 & 4] as I was with Williams' previous books in this series. An herbalist and acupuncturist, she combines traditional folk medicine, extensive scientific research, and her own experience into some of the best practical and readable herbals." - American Herb Association 28:4, 2013??? ?